★Chamber music ensemble "Opus 1"
From the left; Yuko Ando (viola), Mika Sato (piano), Reiko Otani (violin) and Yutaka Hayashi (cello). Please check the concert schedule of "Opus 1" from 'Concerts' page. Born in Osaka, Mika Sato studied at the Toho Gakuen School of Music (High school division and Soloist Diploma course). She continued her studies at the Paris Conservatoire and graduated in 1997 with the Premier Prix. She has studied with Michiko Takeuchi, Pascal Dovayon, Jacques Rouvier, Naoyuki Inoue, Sumiko Mikimoto and Keiko Takeuchi. She won numerous competition prizes such as the first prize at All Japan Students Music Competition in 1987 (West, Junior-High school division), the second prize at Japan Music Competition in 1993, sixth prize at the International Chopin Competition in Warsaw in 2000, finalist diploma at the International Tchaikovsky Competition in Moscow in 1998 and the special prize for her interpretation of Chopin at the Long-Thibaud International Competition in Paris in 1998. Her dynamic performances have led to the brilliant engagements, including recitals and concerts in Europe, Morocco and Japan. She has performed with numerous orchestras such as the State Symphony Orchestra of Russia, Polish National Radio Symphony Orchestra, Warsaw National Philharmonic Orchestra, Niederostreichisches Tonkunstlerorchester, Gunma Symphony Orchestra, The Japan Philharmonic Orchestra, Tokyo Philharmonic Orchestra and Osaka Philharmonic Orchestra. In 2001, she was invited to the Chopin Festival in Paris and in Dusznikach (Poland). Her concert appearances in Annecy (France) and in Gaming (Austria) were highly praised. Maxell has released her debut CD, the live recording from the Chopin Competition. Her latest recording with all Chopin programme will be released in autumn 2002. Mika Sato continues to attract audiences with her musicianship and virtuosity. Born in Osaka, Reiko Otani studied at the Toho Gakuen School of Music with Toshiya Eto and Koichiro Harada. Since 1996, she studied with Igor Oistrakh at the Royal Conservatory in Brussels and there she received the highest Masters degree with “the greatest distinction” in 1998. She won the 1st prize at the Japan Music Competition in 1993. In 1996 she captured the top prize at the Henryk Wieniawski International Competition in Poznan, Poland. She is also a laureate of the most prestigious international competitions such as Spohr in Freiburg, Tokyo, Queen Elisabeth in Brussels, Hannover and Sibelius in Helsinki. Reiko Otani performs frequently as soloist and chamber musician in Japan and abroad. She has performed as a soloist with many orchestras such as Tokyo Symphony, Tokyo Philharmonic, Japan Philharmonic, Kansai Philharmonic, and Kyoto Symphony. She has also invited to perform at many festivals including; festivals in Kurashiki and Saito-Kinen. In addition, she has had the honor of performing for the Japanese Imperial Family at Tokagakudo Hall in the Imperial Palace. Miss Otani's international career has led her to perform extensively in Europe as well. Ever since her sensational debut at the Warsaw Philharmonic Hall in Poland in 1996, she has made numerous tours of Poland, performing with most major Polish orchestras as well as giving recitals, including performances with the Sinfonia Varsovia under the direction of the late Sir Yehudi Menuhin and recital at the International Chopin Festival in Duszniki. In 1999, she won the concerto competition at the International Salzburg Summer Academy, and appeared in the prestigious Salzburg Music Festival. In 2000, under the baton of Philippe Entremont, she performed with the Netherlands Chamber Orchestra in the Amsterdam Concertgebouw. In the United States, she was invited to perform at the Santa Fe Chamber Music Festival and La Jolla Summerfest. In 2002, she gave recitals in Russia, Estonia, Germany, Netherlands and Japan, and also performs as a soloist with many orchestras such as the Kansai Philharmonic, the Kyoto Symphony, Kyushu Philharmonic and the Osaka Century Orchestra. A graduate of the Tokyo University of Fine Arts and Music (BM, MM) student of Junji Suganuma, Yuko Ando has won many prestigious prizes such as the first prize at the 3rd Japan Chamber Music Competition, the second prize (top prize in duo section) at the 17th Vittorio Gui International Chamber Music Competition, and was the semi-finalist at the 52nd Geneva International Competition. She has also won Yasumi Award in 1994 and “The Most Distinguished New Artist Award” of the Ogaki Music Festival 1997 in Japan. Miss Ando has performed with the New Japan Philharmonic and frequently appears in numerous music festivals including the festivals of Kiso Fukushima and Miyazaki. After her successful recital in 1998, the renowned Japanese music magazine Ongaku-no-Tomo reviewed as “the most outstanding concert in this season”. 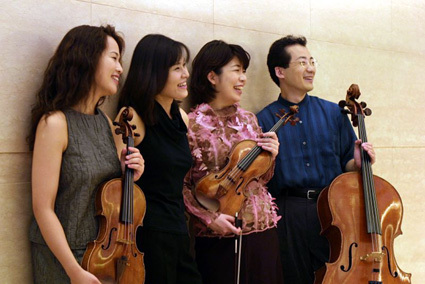 Currently, Miss Ando is the principal violist of the Tokyo City Philharmonic Orchestra, as well as a member of Kioi Sinfonietta Tokyo and Japan Chamber Orchestra. After graduating from the Tokyo University of Fine Arts and Music, Yutaka Hayashi continued his studies at Musik Hochshule in Freiburg and graduated as the top student in 1998. He studied with Ryoichi Hayashi, Yasushi Horie, Reine Flachot, Keishi Miki, Boris Pergamenschikow and Christoph Henkel. Mr. Hayashi won the first prize at the Japan Music Competition in 1993, and received diploma at the A. Tansman International Competition in Poland in 1998. He has been received numerous awards for his performances such as the Aoyama Music Award 1999, the Blue Meer Music Award 2000, the Matsukata Hall Music Award 2000 and the Kobe Governor Music Award 2001. Former principal solo cellist of Osaka Philharmonic Orchestra, Mr. Hayashi have also performed as a soloist with numerous orchestras such as Nagoya Philharmonic, KBS Symphony Orchestra conducted by Okko Kamu, the Tokyo City Philharmonic, the Tokyo Symphony and the Osaka Century Orchestra. Among them, his performance of Dvorak Concerto at the subscription concert of the Osaka Philharmonic Orchestra under the batton of Takashi Asahina was highly acclaimed. Currently Mr. Hayashi is the principal cellist of Izumi Sinfonietta Osaka, and a lecturer of the Kobe Jyogakuin College.